So, the other night I spent the whole evening pulling out my Kauni. I'm stilling going to use the traveling leaves design from the Tailored Jacket pattern but I'm using Ruth Sorensen's cardigan pattern for shaping and gauge. Since it looks pretty sack-y in the pics on Ravelry, I'm adding some waist shaping as well - 3 sets of decreases (at 10, 12 and 14 cm) and 3 increases (at 16, 18 and 20 cm). I've put so much time and thought into this now, the damn thing better fit. Here are some pictures of my progress so far - one with flash and one without. Neither gets the color quite tight, it's somewhere in the middle. Don't know about anyone else but I have ton of baking lately, which always makes me happy. Pecan pie, cookies, more cookies and cinnamon bread. That last was made just to be used in French toast tomorrow. How decadent. 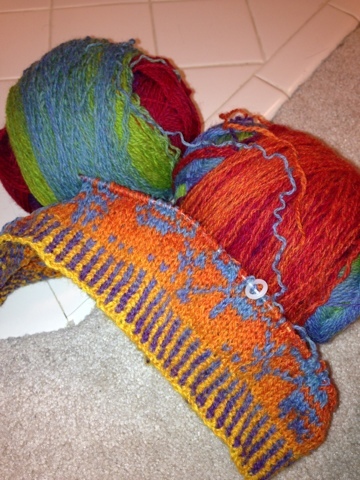 For knitting, my aim for 2013 is to work in color. I've spent the last couple months working in earth tones and I've had it. Kauni, here I come! So I hope everyone is having some wonderful time, hopefully off, with good company. Because I drive a lot (I'm a supercommuter) I ride along on my husbands Audible account. Which I love. And I'm really dull, which you might expect (Austin, Brontes, books on the NSA) but I did want to mention my favorite podcasts. Along with Knitpicks, I'd recommend Mile Duncan's The History of Rome, Kevin Stroud's History of English and any of the Naked Science podcasts - Naked Genetics is my favorite. 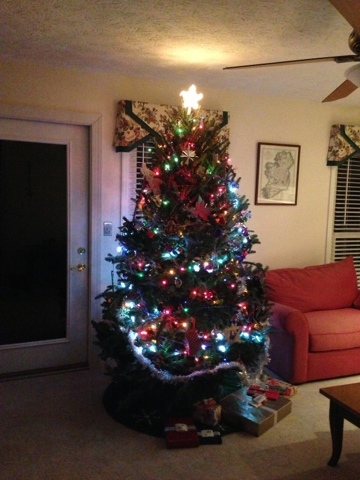 And here's our tree - now the house smells nice. And I'm going to put fewer beads on it than the first version (Goddess Nut) but its coming along. 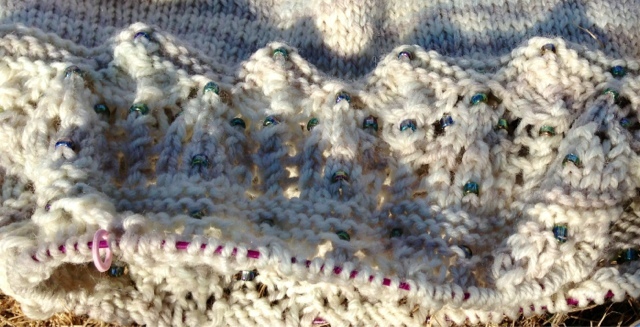 For whatever reason all my Christmas knitting this year was in neutrals and I'm dying to rip out my Kauni and redo it in this vest (http://www.ravelry.com/patterns/library/trellis-waistcoat) maybe or the Kauni sweater (http://www.ravelry.com/patterns/library/kauni-rainbow-cardigan) which would be simpler but I'd want to fit it a bit. Just anything with color! 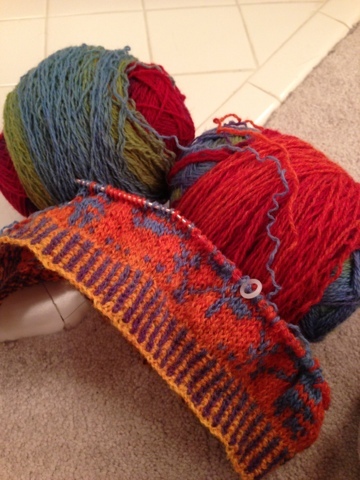 I also really love the Veyla mitts and want to try them in Chroma - maybe with a matching hat? 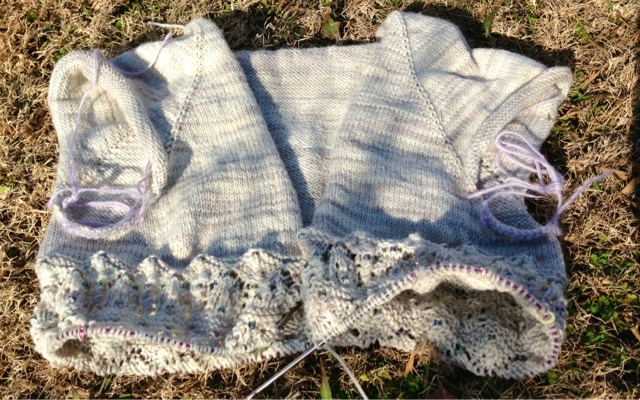 I have some leftovers from the second Stained Glass sweater I made for Elaine, maybe she can be my guinea pig. Our final soccer tournament of the year. 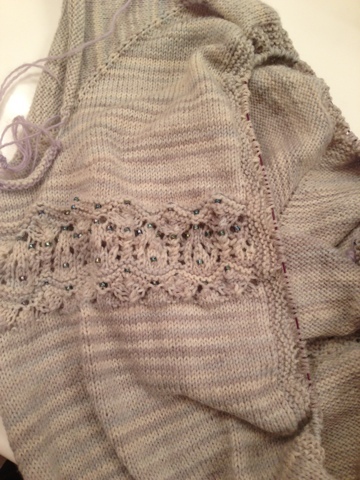 So, I got some work done one the last knitting present. Our parents also got so rowdy that the ref lodged a complaint with the tournament officials. Nice.